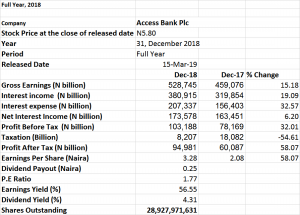 The audited financial reports for the year ended December 2018 for Access Bank Plc and United Bank for Africa (UBA) was released same day on the 15th of March 2019. Dividend payout from the two financial intuitions to investors this season was rather low compared to the previous year. While Access Bank proposed a dividend of 25 kobo, that of UBA is 65 kobo. The full year financial report of the bank for the year ended December 2018 revealed that the group advanced by 15.18% in Gross Earnings to N528.7 billion from 2017’ position of N459.1 billion. Its Profit after Tax (PAT) was up by 58% to N94.981 billion from 60.087 billion in 2017. Profit before Tax (PBT), grew 32% to N103 billion from N78billion in 2017. Access Bank made 19.09 percent growth in Interest Income to N380.92 billion from N319.85 billion it recorded in 2017. The bank’s earnings per share (EPS) is currently N3.28, which is 58% growth from the N2.08 reported in 2017. Relative to the current share price of N5.80, the PE Ratio of Access Bank stands at 1.77x with earnings yield of 56.55%. 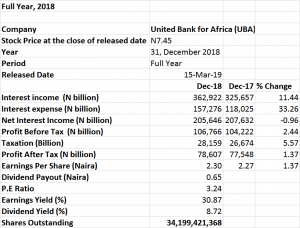 United Bank for Africa made marginal 1.37 percent growth in its profit after tax (PAT) in Full Year, 2018 from N77.548 billion in 2017 to N78.607 billion. Profit before Tax (PBT), grew by 2.44% closing at N106.77 billion from the previous close of N104.22billion. There is 11.44 percent growth in Interest Income to N362.92 billion from N325.66 billion recorded in 2017. The earnings per share (EPS) grew by 1.37 percent to N2.30 from the previous EPS of N2.27 in 2017. At a reference price of N7.45, the PE Ratio of UBA stands at 3.24x with earnings yield of 30.87%. A dividend of 65 kobo per ordinary share of 50k each was proposed to the shareholders. Relative to current share price of N7.45, dividend yield for UBA is 8.72%. The dividend payout ratio for Access Bank is 7.62% relative to its earnings per share of N3.28. The Bank would be retaining 92.38% of its earnings which would be ploughed back into operation to generate more wealth for shareholders. Conversely, UBA is giving 28.26 % of its earnings as dividend to investors while retaining 71.74%. To investors who appreciate cash dividend payout, UBA is by far a better stock to consider. Comparing profit after tax of the two financial institutions, Access Bank Plc is by far superior to UBA with a margin of N16.374 billion. If earning per share is ever a basis for selection, Access stands better consideration than UBA though both institutions’ earnings are impressive despite harsh economic climate. While Access Bank reported a N3.28 EPS for the year under review with earnings yield of 56.55%, UBA reported a N2.30 with earnings yield of 30.87%. Significantly, it could be deduced that Access Bank at N5.80 is currently underpriced relative to its intrinsic value as at Full Year 2018. Seeing that UBA currently commands a price of N7.45, Access bank is technically cheaper. In the Nigerian stock market, dividend payout is an issue. General expectation is a dividend yield in excess of 10%. Seeing that the dividend yield of 8.72% in UBA is far more than that of Access Bank at 4.31%, investors’ sentiment will tilt more to favour UBA in the short term. Access Bank is projected to overtake other leading tier 1 financial institutions combined in terms of assets, capitalisation, topline growth, branch network and technology when its merger with Diamond Bank is fully consummated.